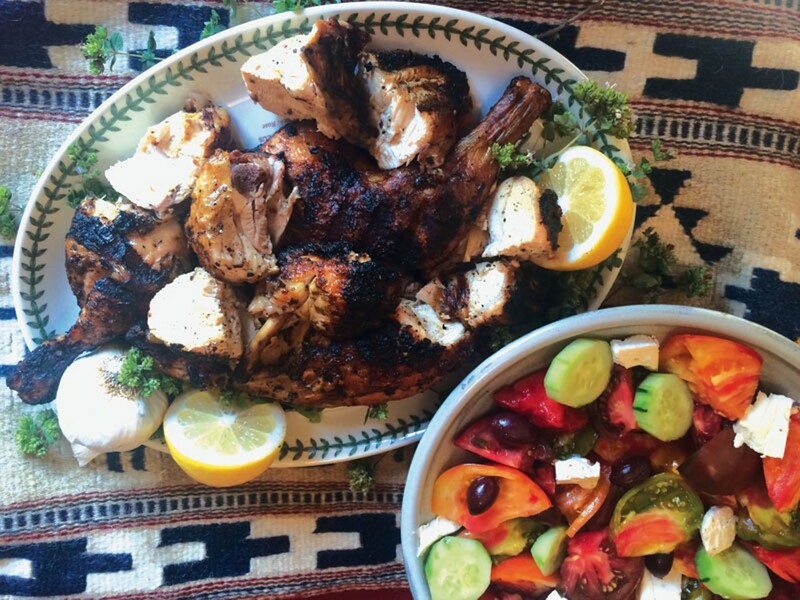 Classic Greek revival: grilled chicken and tomato salad. As we approached a small village at dusk, the view through a thick haze of barbecue smoke was a sea of tables and chairs under large plane trees. Men were playing backgammon and sipping ouzo. It was here on a back road in Greece — Iria Beach — that we had the best barbecued chicken ever. It was served simply with a huge vine-ripened tomato salad, French fries and crusty bread — a meal to remember. To prepare the chicken, choose young split fryer halves. Larger pieces of chicken are easier to handle on the grill and remain succulent and juicy. The butcher can cut up the bird for you or you can do it yourself. Poultry shears are a useful tool for doing this. Simply cut up one side of the backbone, pry the chicken open and cut down the other side of the backbone and remove it. From the inside of the chicken, cut upward along the breastbone. Removing the small pocket of rib bones is optional — just slip a knife or scissors under the membrane encasing the ribs, snip around the thin rib bones and remove them. An oven grill or outside barbecue will work equally well. The men at the beach threw handfuls of dried oregano stems on the fire to enhance the flavor and they used a squirt bottle of vinegar to quell unruly flames from the fat dripping. Just don't be tempted to sabotage this recipe with garlic powder and bottled lemon juice. This chicken begs for an heirloom tomato salad. Think beyond red. A trip to the farmers market will provide an array of vine ripened beauties. Try the black Russian, green zebra, black Krim, Cherokee purple or black pineapple. Cut up a few pieces of chewy bread, such as ciabatta, into one-inch cubes and place them on a deep platter. Cut a selection of colorful tomatoes into large bite-sized pieces. Place them on top of the bread cubes, which will soak up all of those delicious juices. Place a few slices of cucumber on top and dress with good olive oil (a good time to try Henry's olive oil and olives) and fresh lemon juice or Balsamic vinegar, salt and freshly ground black pepper. Top it with olives and a few slices of feta cheese. In Greece, feta is made from ewe's milk and sometimes goat's milk. It's possible to buy imported ewe's milk feta locally but our local Cypress Grove chevre works well. While the chicken is grilling, roast a few potatoes, compose the salad and then enjoy Iria Beach chicken. Additional fresh lemon juice, salt, pepper and oregano for dressing the chicken after grilling. Wash and dry the chicken. Remove any excess fat or skin. Break the wing, hip and knee joints by bending them backwards, as this allows the chicken to remain flat during the grilling, exposing more skin for browning. Then use the palm of your hand to flatten and even out the thickness of the meat. Rub the chicken with garlic, salt, pepper, oregano, olive oil and lemon juice. Try to get some of this seasoning under the skin if possible. Place in a plastic or ceramic container (not aluminum) and let it marinate in the refrigerator 12 to 24 hours. If you're broiling inside, cover a cookie sheet with foil and place it on a rack; if grilling outside, place the chicken directly on a hot, oiled rack. Grill the meat rib side toward the flame or coals for 20 to 25 minutes. It will be smoky-dark and the bones may look a little bit charred, but you're not eating them anyway. Turn the skin side to the flame and continue cooking another 20 minutes until the skin is a very deep golden brown. Baste frequently with the marinade. The chicken is cooked when your meat thermometer reads 170 F or when you pierce a thigh and the juices run clear yellow. If the skin is dark but the chicken is still undercooked, finish it over indirect heat with the lid closed on the grill or in the oven inside. This will avoid burning the skin. Remove the chicken from the heat and let it rest for 10 minutes before cutting or serving so the meat can reabsorb the juices. Cut the breast into 4 to 6 pieces and the thigh and leg into 4 pieces. Pile the meat on a platter and dress it with additional lemon juice, salt and pepper just before serving. Betty Thompson wrote a regular food column for the Journal starting in 1990. She teaches occasional cooking classes through the North Coast Co-op.